Tony Fretton Architects has completed a new-build café and restaurant in one of London’s and the world’s most historically significant locations, the Tower of London. The site forms the intersection between Tower Bridge and the UNESCO world heritage site of the Tower of London on the historic Tower Wharf to the Thames overlooking the Greater London Assembly building and HMS Belfast. 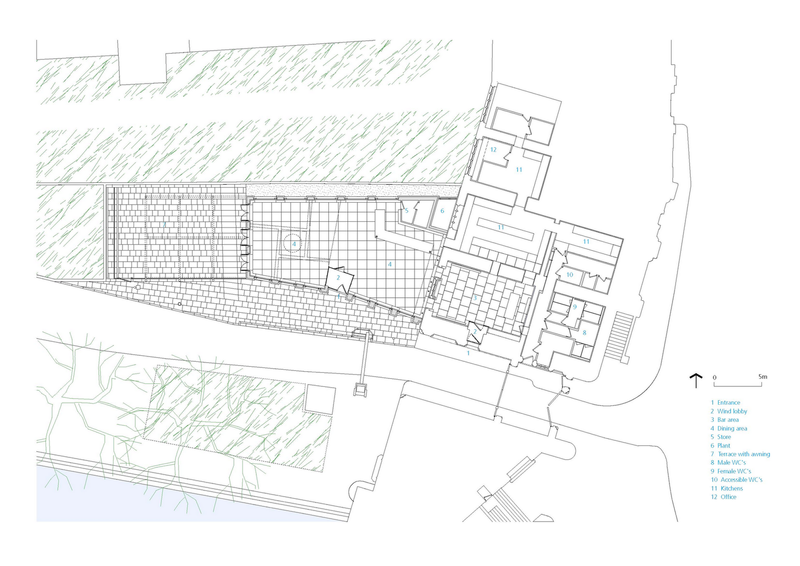 The new development has been commissioned by Historic Royal Palaces – the independent charity that looks after the Tower of London, Hampton Court Palace, the Banqueting House, Kensington Palace and Kew Palace. 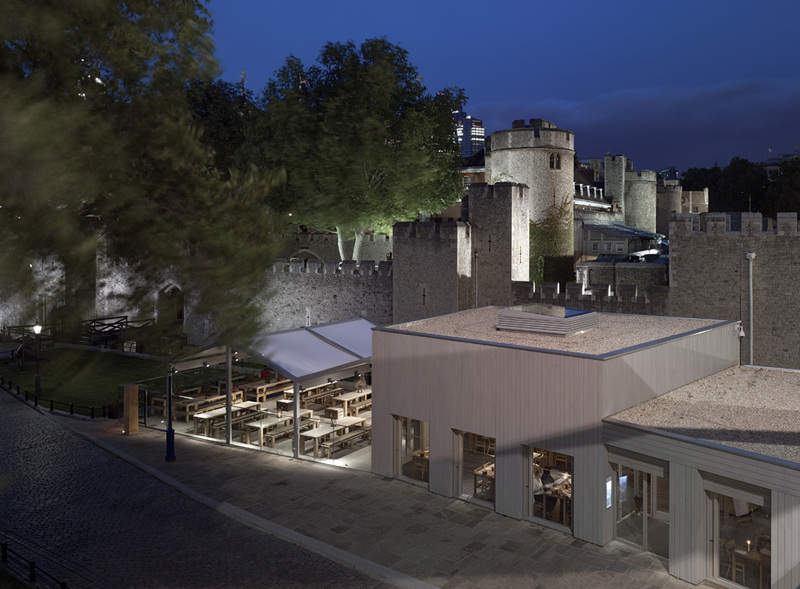 Tower Wharf Café provides indoor and alfresco dining on the wharf, serving the 2.5 million tourists that visit the Tower of London each year. It adds to an assembly of pavilions, including a ticket office and river frontage kiosks. Positioned closer to the Tower and further from the main tourist entrance than these kiosks the new building demanded a design that is visibly striking and fanciful. It takes its cue from the Tower itself instead of the hi-tech architecture of the neighbouring City district or generic garden pavilion architecture. The new building responds playfully to the Tower’s outer wall, an assembly of towers and curtain walls of differing height and form. 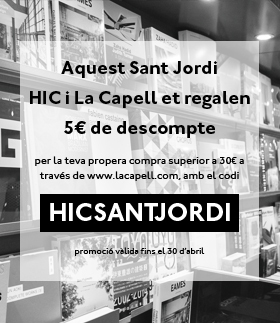 It is made up of four linked volumes, housed in two discrete forms: one is like the castellated wall turned upside down with the space between the battlements becoming glazed recesses. 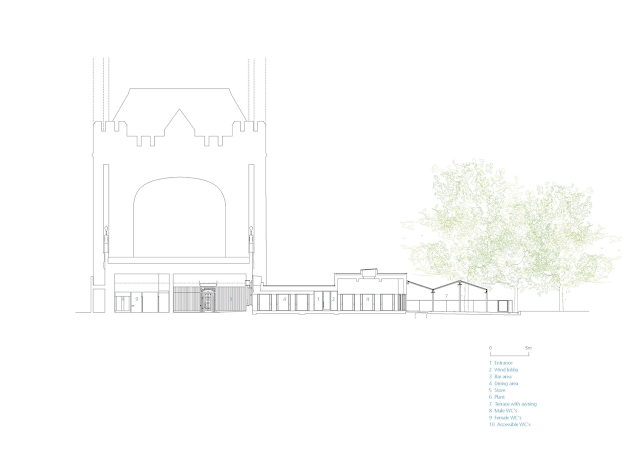 The other is a long low-rise form joining the arch under Tower Bridge. Both are clad in rough sawn English Sweet Chestnut timber in a vertical formation. The timber is painted grey to match the hues and tones of the Kentish Ragstone rubble with limestone dressing of the Tower Walls and the Cornish granite blocks with Portland Stone dressing of the bridge. 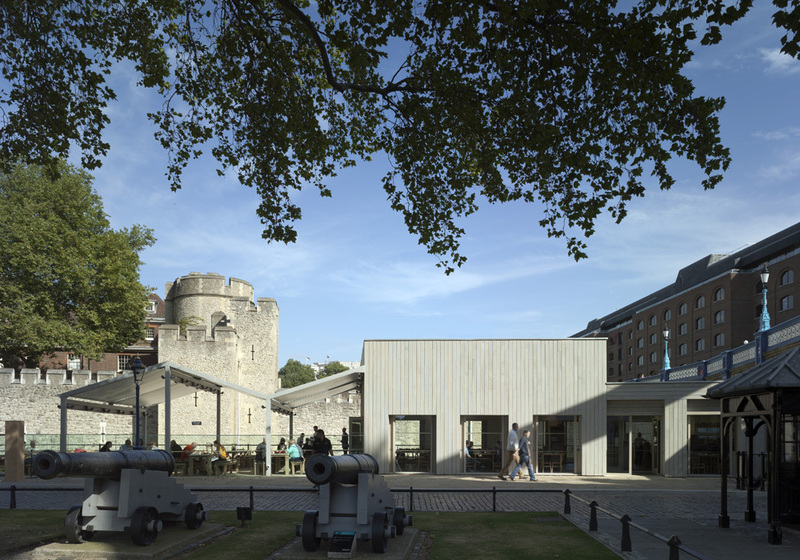 The use of rough timber continues the tradition of using the material in the utilitarian buildings that have historically occupied this site on the wharf. The entrance is via a glazed lobby at the centre of the wharf elevation into a tall dining room and bar accommodating 100 covers. 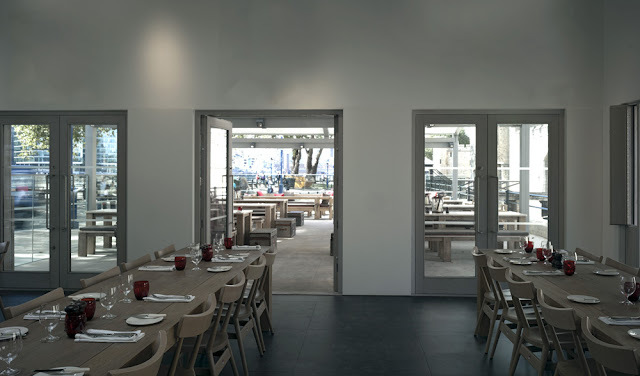 The dining hall opens out at the eastern end into an expansive glass-walled terrace serving an additional 60 covers. The terrace is paved with smooth sawn Yorkstone with elongated slabs demarking the remains of a historic wall on the site dating from the seventeenth century. 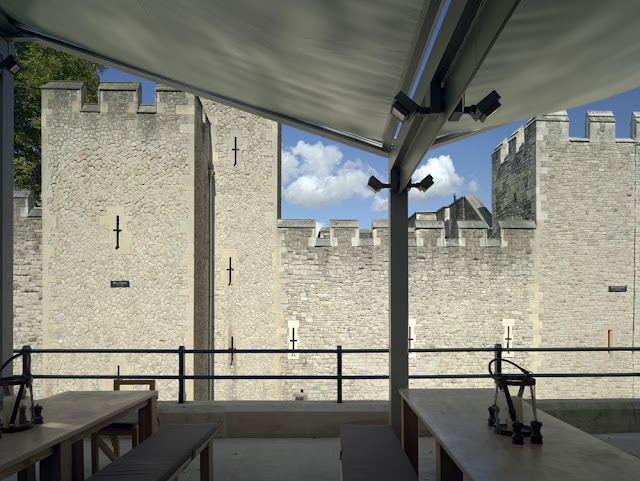 A pitched roof of motorized retractable blinds and sophisticated guttering system ensures that the terrace can be used in all weather, providing alfresco dining against the backdrop of the Tower day and night throughout the seasons. The dining hall is a light-filled space characterised by a central oculus skylight. A narrow band of glazing at the western end provides a light-of-touch interface between the new building and the arches, giving diners an unexpected view upwards to Tower Bridge. All of the windows are fixed with opening wooden side panels providing natural ventilation. The south elevation facing onto the wharf is fitted with electric blinds, which are perforated to allow ventilation during hot weather. The arch under the Tower Bridge provides a setting for a more intimate cavernous oak lined bar and accommodates back of house kitchen and support functions beyond. 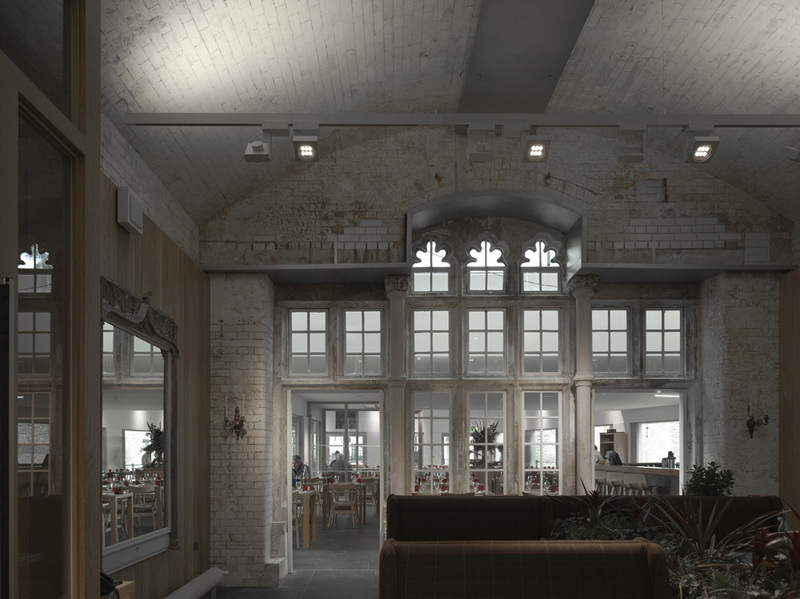 The original solid oak door under the arches, which dates from the construction of the bridge in the 1880’s, provides a dramatic entrance through the bar to the restaurant when the wharf gates are closed at night. 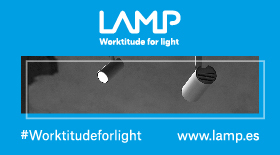 At night, Erco ceiling lighting provides focused pools of light on each dining table. 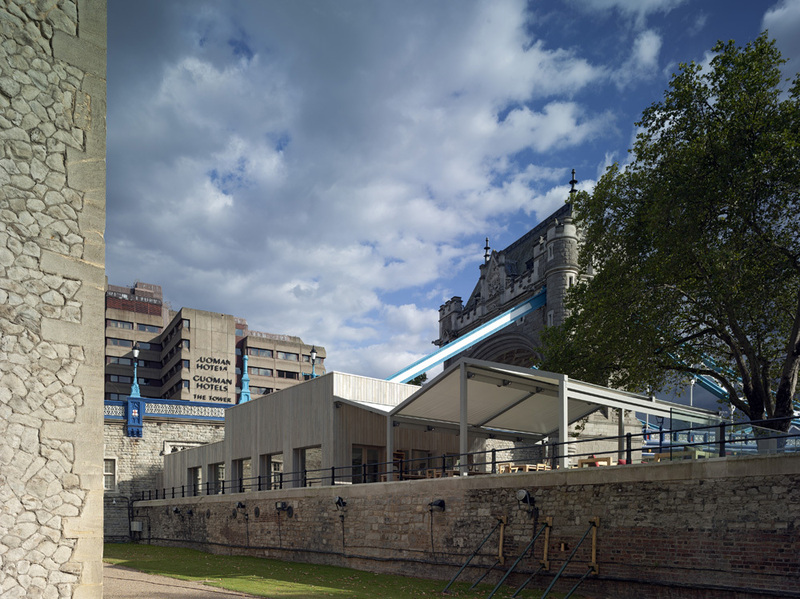 The building itself will be in shadow as diners inside and on the terrace will look out onto illuminated landmarks on every side. 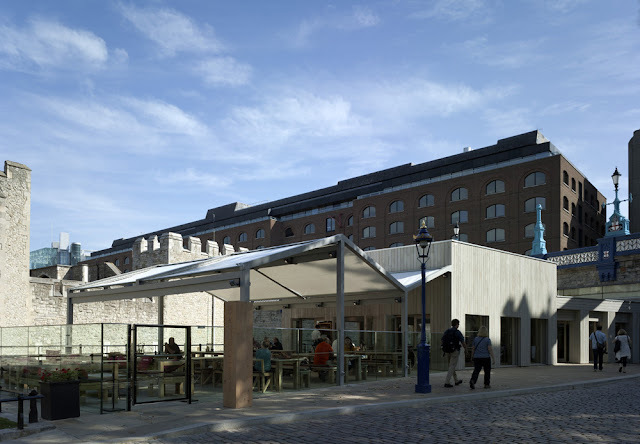 Tower Wharf Café is a significant addition to London’s cultural and historical riverside. The design demonstrates sensitivity to the heritage of the Tower whilst acknowledging the popular culture of the wharf.